to create the appearance of the Gazprom Neft corporate university. Gazprom Neft has its own Corporate University for its employees. It is a real university where the company’s employees are taught by internal trainers or specially invited lecturers and experts. Do you want to learn more about the company’s digital transformation, blockchain and big data? Sure, here is a video and the lecture is this Wednesday. Want to improve your English? Sure thing, just sign up and start learning. Or maybe take a course on new oil production technologies? You are already included in the target program! The knowledge base contains thousands of articles and hundreds of educational programs. The classes are conducted both online and offline and after completing training many employees are able to solve their tasks in new and creative ways. 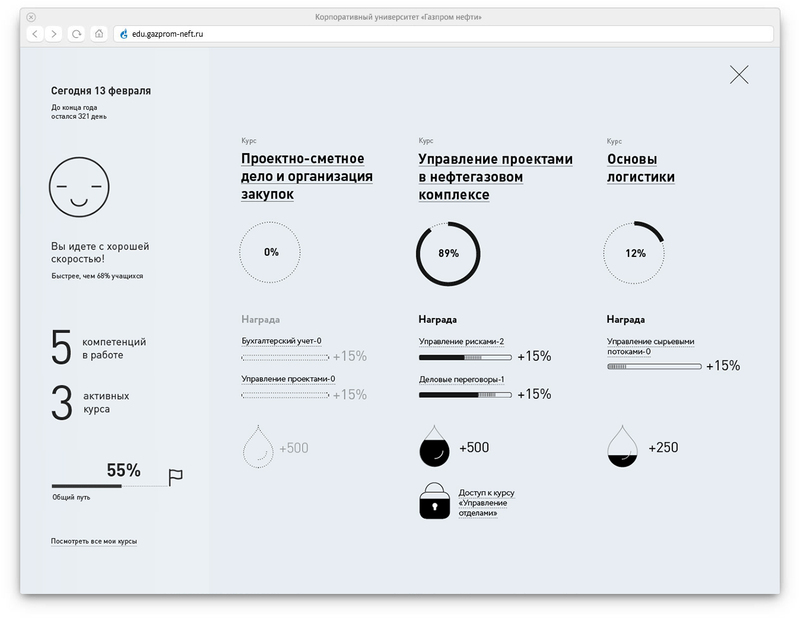 Mock-ups of the Corporate University website were created in the studio. The website has a single ambitious goal that drives its internal meaning: to inspire people to continue their education. Taking a course on oil and gas logistics is more challenging than lying on the couch, so the service rewards users for any achievements on their difficult path. First of all, the page adapts to the needs of each employee. 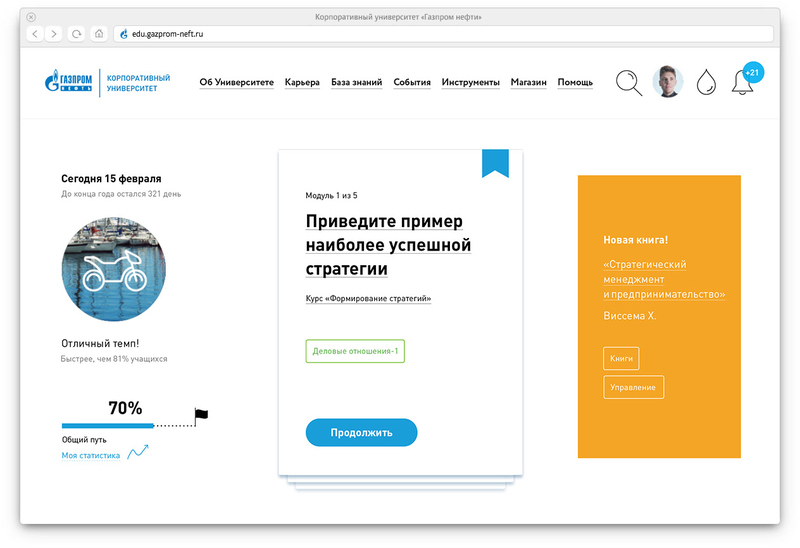 Simply choose a course and the screen shows the progress of your training, announcements of related articles, relevant books and valuable tips. From time to time information on other interesting courses comes up. You like mining and oil and gas geology? Great, read more about mine surveying! Secondly, the website includes a large-scale incentive system. Any action is rewarded with internal currency, barrels. Fill in your personal details and get ten barrels, take a test and collect fifty. Barrels can be exchanged for pleasant gifts and souvenirs and create an exciting game-like atmosphere. In addition to that, the application uses a large set of friendly icons that provide positive reinforcement for each action. The quick speed of training is marked by a picture of a bicycle, completed tests by a smiley face and the end of a course is celebrated by a victorious flag and a crown. The employee’s personal information is shown on the account page. It contains a log of all actions, acquired skills, published articles and chosen courses. The website is extremely easy and comfortable to use. The menu is grouped in logical blocks, there are no irritating duplicated subitems and the important information is always large.